Pumpjacks extract oil in the Bakken. To understand what it will take to get to the next million, it’s important to know how the Bakken oil patch evolved to arrive at today’s production levels. Gov. Doug Burgum set the goal this summer of producing 2 million barrels per day. It’s his deputy, Lt. Gov. Brent Sanford, who has a first-hand perspective on this subject. Before his current job, Brent Sanford was the mayor of Watford City, a small town at the epicenter of the state’s oil activity. Back around 2004 he noticed something interesting. At the time, oil companies were trying out new technology across the border in Montana. Not only were they drilling deep into the earth, but they were turning the drill horizontally through shale rock. They sent a mixture of water, chemicals and sand into the well at a high pressure to perforate that rock and release the oil. It took three years for this new drilling method, hydraulic fracturing, to move into North Dakota. It jumped across the border to an oilfield 100 miles away. “I remember companies saying oh my goodness, there’s nothing in between,” says Kathy Neset, a geologist and the owner of Neset Consulting. She’s referring to all the space between the drilling in Montana and the new activity on the eastern edge of North Dakota’s oil fields. “Well here we are 10, 11 years later and there’s a whole world of Bakken in between,” she says. It was in the mid-2000s that her geological expertise became really in demand. At the time, she was working out of her farmhouse. “We realized we needed to get a little more space,” she says, explaining that her dining room table was overflowing with files. Her business moved to a bigger building and today, it’s in an even larger one. Neset Consulting is housed in a 28,000-square-foot facility with an office staff of 25, plus 80 or so geologists working on rig sites. When drilling in the Bakken started to take off 10 years ago, the oil patch posed a major challenge for the state. It lacked supporting infrastructure to transport the crude or to capture the excess natural gas. As a result, truck traffic plagued everyone in Watford City. “You would drive in from one of the river valleys … and know that you’re there from a cloud of dust,” Sanford says. Today, thousands of miles of pipeline carry oil and gas and wastewater where they need to go. 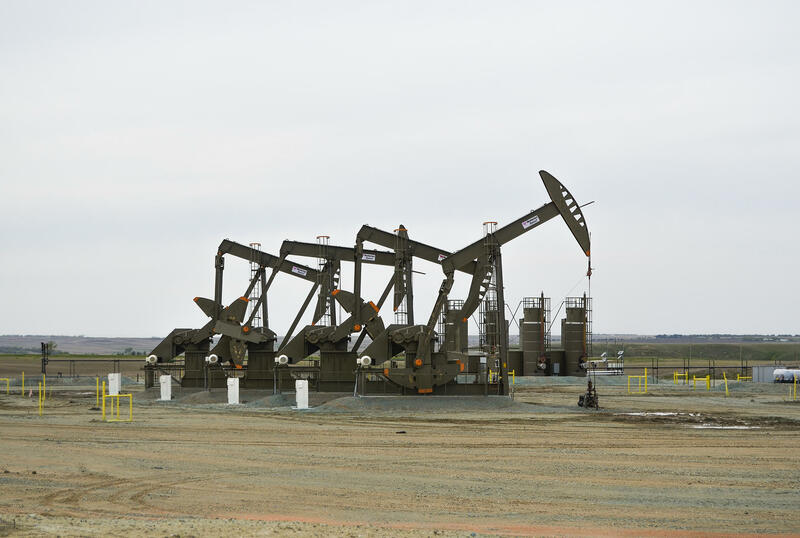 In 2014, North Dakota’s oil industry reached the 1-million-barrel-per-day milestone. But that milestone is also to blame for what happened next. The development of shale plays like the Bakken sent the world’s supply of oil skyrocketing, the price of oil collapsed. Still, production has hovered around that 1-million mark the past few years. So, Will The Bakken Get To 2 Million Barrels Per Day? The governor has touted his goal of doubling production to 2 million barrels per day at several public events the past few months. Jenna Delaney, a senior oil analyst with S&P Global Platts, says oil companies in North Dakota have recently been drilling around 100 wells per month. “Looking out about 10 years from now, production in the Bakken would be at about 1.5 million barrels per day,” she says, assuming companies continued drilling at today’s rate. That’s not quite the governor’s goal, but still a significant jump. Delaney says she indeed sees production headed that direction. The price of oil has climbed this year up above $50 per barrel, and she sees it increasing slightly into 2018. “Ultimately, what happens with those prices will drive how many wells come online each month,” she says. Both the lieutenant governor and Neset, the geologist, say technology will also play a role. Ten years ago, companies could extract only 4 percent of the oil stored in shale rock, Neset says. Today, it’s more like 8 percent. The oil industry is no stranger to booms and busts. Unexpected factors can have a big impact on production levels in a relatively short period of time. If a war broke out in oil-rich Middle Eastern countries, it could disrupt the global flow of oil and send prices skyrocketing. That would likely propel production forward in the Bakken. But there’s also a chance the opposite could happen. If, say, a future presidential administration that’s less fossil-fuel friendly were to impose strict environmental regulations on the oil industry, production could taper off. Looking further ahead, it’s also possible that an industry like electric cars could grow and reduce the demand for petroleum. Lt. Gov. Sanford knows that’s a possibility. “It just seems like a goal to not have as much reliance on petroleum,” he says. Another challenge is infrastructure. Right now, thanks in large part to the newly operational Dakota Access Pipeline, the state has more than enough pipelines to carry its oil to market. This cheap transportation method is making Bakken crude more competitive with Texas oil. But should the state produce more than 1.3 million barrels per day, it will max out its pipelines. Oil analyst Delaney says if that happens, the Bakken would lose its new competitive edge. “Then we’ll either need to see more pipeline projects proposed to move more of this crude oil, or we’ll see more barrels moving back onto rail,” she says. Oil companies will need to plan carefully so the Bakken is ready for its second decade.